We take about 5-6 clients for our custom design process each year. to learn about your event to know about every detail that needs to be created to insure that uniqueness. $10k+ for save the dates, invitations and day-of goods. To get started, fill out our quick Inquiry Form to schedule a consultation. During your consultation, we will discuss the look, feel and tone you want your paper goods to evoke and will decide whether or not you qualify for our custom process. 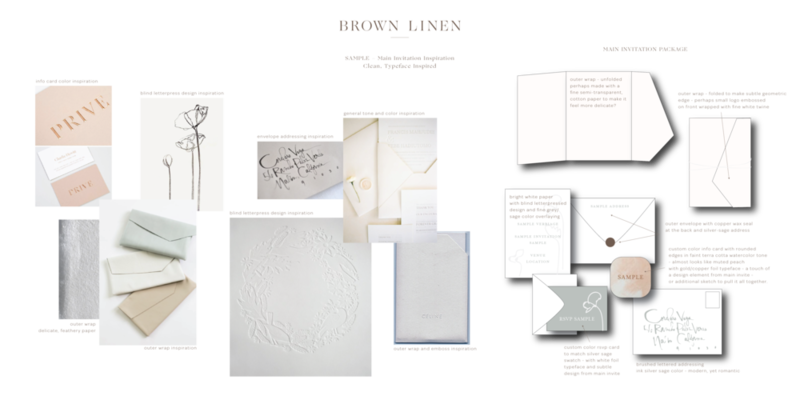 We gather all the details and answer any questions to help you explore all the options available to build your perfect invitation suite! We talk about all the customizable options, learn about your love story and ask tons of questions about where you are getting married. Every detail matters as we begin to dream about your unique design. After your consultation, we send you an estimate for all the items and details that we have discussed in the consult along with a comprehensive schedule to clearly define every deadline and when to expect all your items. We can make any adjustments you need until you are satisfied. 50% of your invoice is due to begin designing. To begin, we create a beautiful mood board just for you - filled with images, textures and colors that we present before we begin designing. This board allows us to make sure that we are all on the same page and to capture the overall look and feel. It's an exciting part of the process. Once you have approved the inspiration board, we send you a request for all your content and verbiage. We then create a digital proof of your entire suite for you to see how the entire suite will look. We offer a few rounds of revisions to be sure that the proof is perfect to your liking and that you feel really confident in your decisions. Upon approval of your proof, we send everything off to the printers! Depending on the paper, embellishments and printing style you choose, printing can take a few weeks. When we send off your suite, we will confirm an expected arrival time with you within 48 hours. 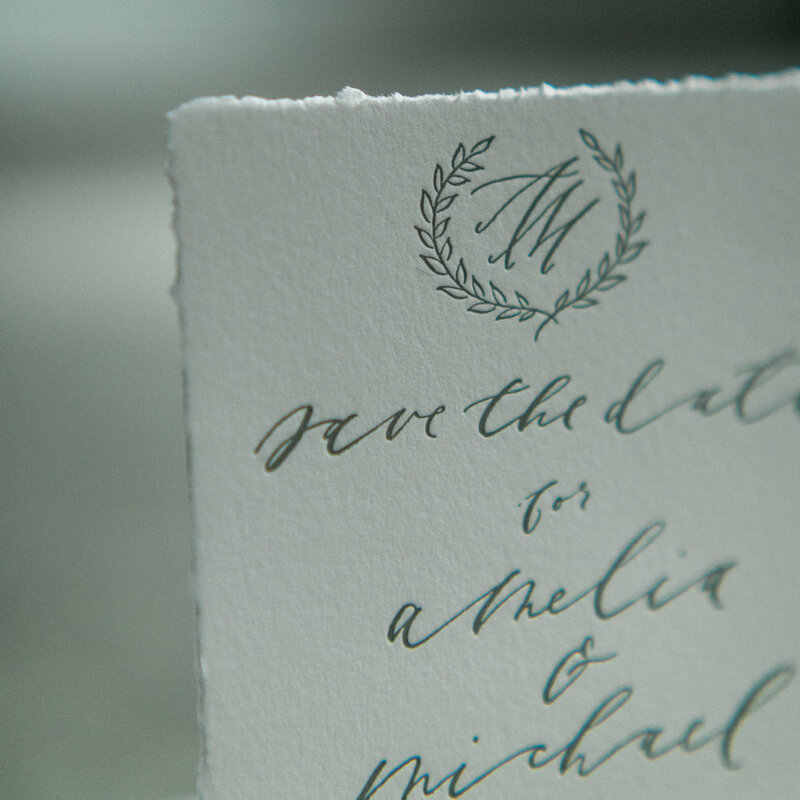 When we receive your invitations, we prepare the prints and fulfill any calligraphy services. Assembly and stamping is included with the custom experience. You can choose to have the read-to-go invitations shipped to your home and you can mail them out, or we can mail them from Atlanta for you.